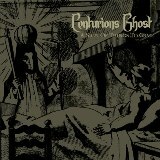 Musically CENTURIONS GHOST are a critic’s worst nightmare being heralded as a Doom, Black and Death metal band and in fact, they are a mixture of all of these genre's. In reviews A Sign of things to come is often compared to the works of CELTIC FROST, USURPER, VENOM, CANDLEMASS and CATHEDRAL, having the same rawness as the first three acts and the epic, lead filled qualities of the two later. And the reviewers have been raving, Terrorizer gave the album 9/10 and it became pick of the month in SOD Magazine. Get it and get crushed!